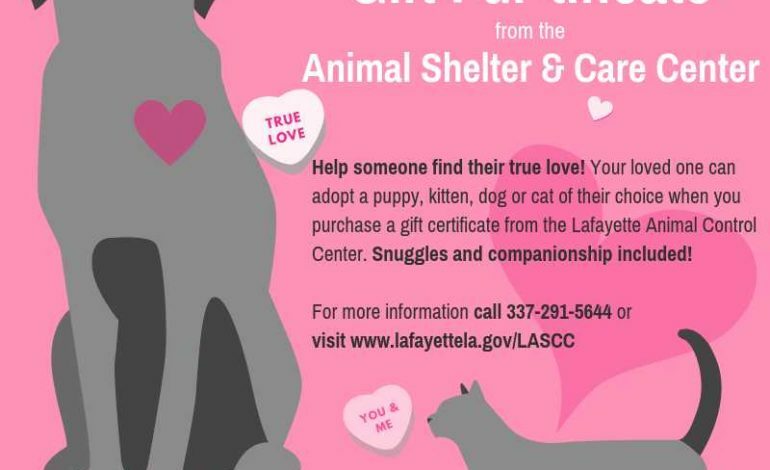 This Saturday, Feb. 9 is a second chance for animals at the Lafayette Parish Animal Shelter and Care Center (LASCC) to find their forever home. LASCC’s monthly “Second Chance Saturday” adoption event will be held from 1 p.m. until 3 p.m. at its facility located at 613 W. Pont Des Mouton Rd. in Lafayette. The event is open to the public for anyone interested in adopting dogs, puppies, cats or kittens housed at the shelter. For individuals interested in gifting a shelter pet, adoption gift certificates are the best option. Giving an LACC “Gift Fur-tificate” ensures that the recipient is ready to welcome their new pet and allows them to select a puppy, kitten, dog or cat of their choice. LASCC adoption gift certificates are available for purchase at the shelter and cover costs associated with regular adoption, including spaying/neutering, vaccinations and microchips. Every adoptable animal from the shelter is neutered or spayed, vaccinated, heartworm tested and microchipped, a value of $200-500. As part of their “More to Love” promotion this Saturday, the adoption fees are waived for dogs over 30 pounds. Regular adoption fees for dogs and puppies are $35 and $25 for cats and kittens. Adoption fees are waived altogether for military veterans with IDs and senior citizens over 65 years of age. Cash, Visa, MasterCard and Discover payments are accepted at LASCC. LASCC will only be open for adoptions on Feb. 9 and animals will not be accepted for intake on this day. Regular adoption hours are from 1 p.m. until 4:30 p.m., Monday through Friday. For more information on the Lafayette Animal Control Center visit www.LafayetteLA.gov/LASCC.